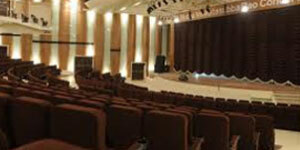 The Sir Mutha Venkatasubba Rao Concert Hall was commissioned in Feb 2008 for the preservation & propagation of Indian & all other forms of art & culture. The complex consists of an 1192 two level air-conditioned theatre with a 1920 sq.ft. stage, an art school, a gallery / lounge in the basement and a coffee shop. Equipped with some of the most advance audio & lighting equipment, this complex will be a one-stop shop which can cater to anything from a solo performance, a street play, to a philharmonic orchestra.